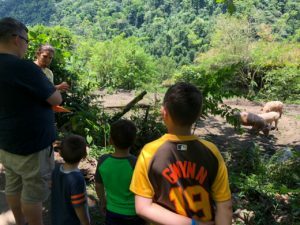 Ecolodges in Costa Rica are a dime a dozen, but what does that really mean? 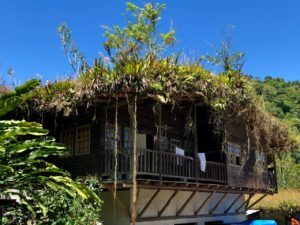 Costa Rica is heavily focused on environmental sustainability, but the degree to which each ecolodge does that seems to vary substantially. It’s pretty fun to take your kids somewhere where they can see where the electricity, hot water and food they eat comes from, and don’t just think that “eco-friendly” means tossing their pop cans in the recycling bin. Somewhat unwittingly (let’s be honest: we were desperate because someone didn’t make reservations ahead of time for our last two nights in Costa Rica and we were about to have to sleep with the kids on a beach somewhere…or worse, in high-rise two-star San Jose hotel), we landed at the ecolodge to beat all ecolodges: Rancho Margot. Pretty lucky for us! And proof that poor planning sometimes does end well. A living roof…need I say more? 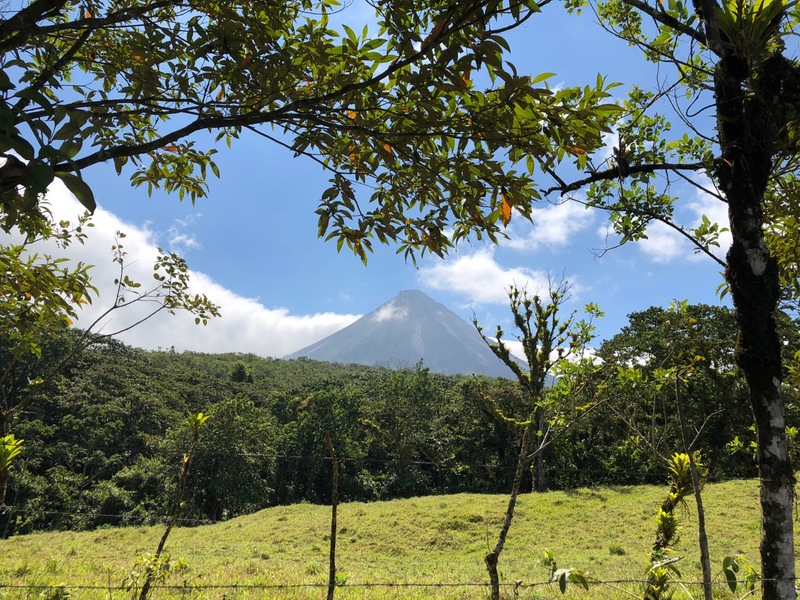 With an official location of “three kilometers past Castillo” (a Costa Rican address if there ever was one), Rancho Margot is an organic, sustainable working farm situated on the shores of Lake Arenal with Arenal Volcano hovering over it. Getting there was a little more arduous than we expected, but aren’t all the best things off the beaten path? Just past the town of La Fortuna, you turn onto a dirt road. There are signs for everything EXCEPT Rancho Margot, which had us a little concerned for several kilometers (meaning my husband and I were shooting barbed, passive aggressive comments at each other while I threw whatever junk food I could find in the bottom of my backpack at the hungry kids in the backseat), but that only made the thrill of finally arriving there at sundown all the more pronounced. The lodging is made up of individual bungalows surrounded by lush, gorgeous jungle. The bungalows are spacious and comfortable, with two large king-sized beds, a private bathroom, and a nice wrap-around porch with a hammock for afternoon naps. They are scattered over a hillside, so this would be challenging for anyone with mobility issues (we did have to carry the toddler back after dinner.) You will quickly learn the best trail from your room to the common areas, and they provide transportation via golf cart for getting your luggage to and from the parking lot. 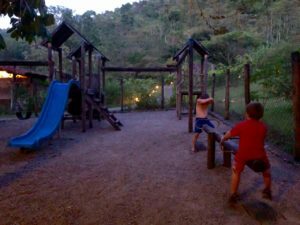 Rancho Margot has a brilliantly located small playground right off the common eating area. Here’s what’s amazing about this place: almost everything. It’s totally off the grid, with electricity from solar and hydropower. Three meals a day are included, and I don’t know who the chef is, but he/she is phenomenal. Most the food (all organic) in the restaurant comes directly from the ranch. All the milk, for example, is hand-milked from their cows daily, and all the eggs every morning come from their chickens. This place is GREAT for families! They (brilliantly) have a small playground right off the common eating area, and my kids made new friends at every meal. Their restaurant provided a good assortment of foods that my kids would eat (including pizzas at lunchtime as an option for people who didn’t like the main dish, and pancakes at breakfast as an alternative to their delicious take on the traditional Costa Rican gallo pinto). We weren’t the only ones there with noisy little ones, and they appeared to do a good job of grouping those of us with crying kids away from quieter couples. 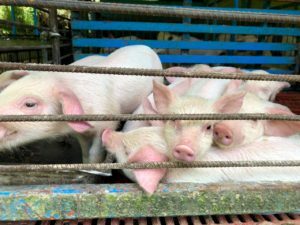 Maybe you don’t think learning about pigs on vacation sounds like fun, but you think wrong. My kids easily spent a whole day just exploring: watching ants, looking for hummingbird nests, going for a swim, looking at animals, taking a break to play the assortment of games they have in the bar, guzzling delicious fruit smoothies, and napping in the hammock. There is free yoga twice a day on a yoga platform surrounded by lush vegetation, overlooking a pond. The resort features natural hot and cold swimming pools, meaning the cold pool is covered, and the warm pool is in the sun, and when you are done swimming, consider hiking up the mountain for a stunning view. You can help milk the cows for free, if you get bored, which you won’t, because some of us could spend all day just studying the leaf-cutter ants who have mown down tiny highways across the footpaths. for the adults, while the kids loved getting to feed the chickens and the pigs and holding piglets. After that, we had to tear them away from the worm compost and the graded piles of aging manure/fertilizer. Also, we washed a lot of hands. This is a lovely place. 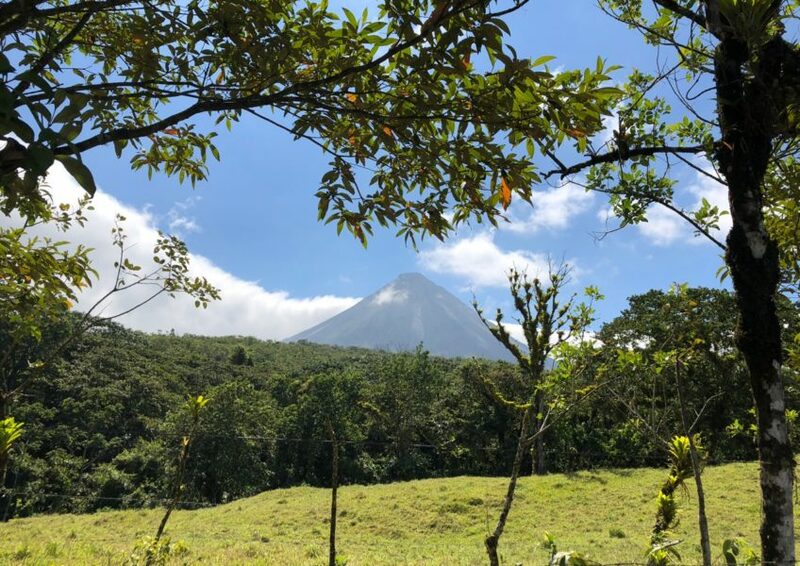 With our little kids, two nights was perfect, but if you wanted to stay longer, it’s also a good location from which you can take day trips to the hot springs of La Fortuna, kayak Lake Arenal or go horseback riding, which Rancho Margot offers. If we had time, we would have spent a night or two afterward in La Fortuna and visited the hot springs, such as those at Baldi or Tabacon. It’s two to three hours from San Jose: a good spot for the beginning or end of an unforgettable trip to Costa Rica.